This tutorial demonstrates the use of the FileField model field to save user submitted files in a Django 1.5 web application using Django’s generic Class-based Views (CBVs). This code will demonstrate how to handle user submitted files using Django’s generic Class-based views (CBVs). This tutorial does not cover access control; anonymous users can upload files and publish them immediately. 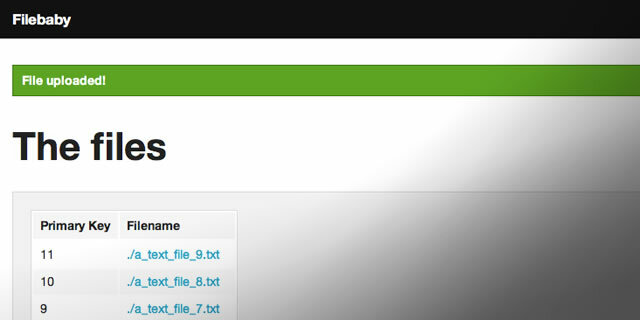 Control over who uploads and downloads files using generic CBVs is covered in the Django documentation. This app was not tested on any Windows operating systems. You can follow along by downloading the completed code and running it, or by visiting the repository. Ensure the code works by running its tests. Running these tests will verify that things will work as expected for the rest of the tutorial. Open the ‘/add’ URL (hint: try http://localhost:8000/add). You should see the following. When your user clicks the ‘add file’ button on the app it loads the ‘/add’ URL. An empty form is presented. The user attaches a file and uploads the file back to the ‘/add’ URL. That file is received as a POST with file data and Django processes it. When processing is completed, the class-based view emits a redirect to the user’s browser asking it to load the success URL which in this case is the home page. A success message is displayed. Where does Django store your uploaded files? Django expects a full absolute pathname. You could put in a text string, but I usually set up a PROJECT_ROOT variable which is calculated relative to the directory containing all the project files. Put it at the top of the settings file somewhere. Once configured, you can use it to build your absolute pathnames in your project. Now let’s look at the model for the user files. """This holds a single user uploaded file"""
The FileField model field has one required attribute named ‘upload_to’. You must set this. You have three choices for this attribute: a string containing a period (as shown), a ‘strftime’ format string or a custom callable (usually a function but it can be any callable). I’m going to leave this as a dot string. This will ungraciously dump all your user submitted files into the MEDIA_ROOT directory. For your own application, you might make this a named user directory, a hashed string or something more appropriate than a dot string. To do this, you can set the ‘upload_to’ parameter to use a callback. If you open this file you will be bored to tears. 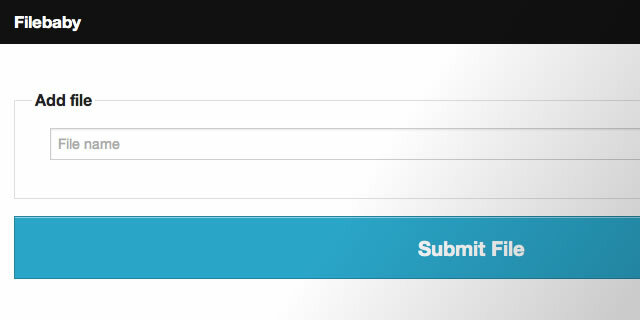 """Upload files with this form"""
There is nothing remarkable about this class so I won’t dwell on it. More information on ModelForms can be found on the Django web site. The form_class is the FilebabyForm we discussed earlier. The FormView expects a form and one must be provided; here it is. The boring version contains only the important parts of the form: enctype setting, file input and errors placeholder, submit button and cross site request forgery (CSRF) token. That’s it. The form_valid method runs when the form passes validation. Since we are uploading a file, this method is activated when a file is received. The form instance is passed to the method and we need to save it to place the file in the MEDIA_URL directory. A success message is displayed. The path ‘/add’ gets mapped to the FileAddView. A helpful name is provided to use the reverse helper in the templates. Naming your URLs is not required but I do it. In order to serve the user submitted files while you are developing your site, you need to add some code to the URLConf. 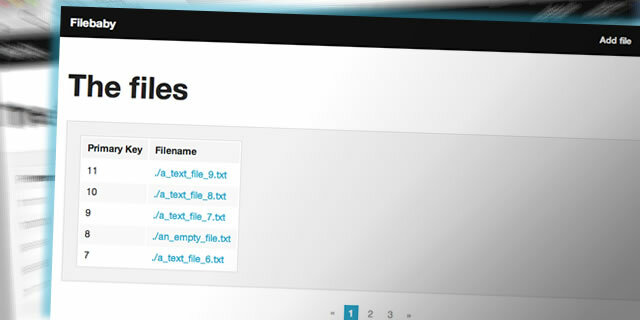 The home page uses a generic CBV called ListView to display the list of files. The implementation is standard except for the default query which orders by largest primary key (in lieu of a date value). class FileListView(ListView): model = FilebabyFile queryset = FilebabyFile.objects.order_by('-id') context_object_name = "files" template_name = "filebaby/index.html"
I won’t dwell on this since it is outside the scope of this tutorial. It does have working pagination and a Foundation 4 compatible Django messages implementation which might be of interest to some. That’s it for the tutorial. Go build your app now. Have you ever implemented an upload app via a FileField using view functions? Do you find the generic Class-based View (CBV) method an improvement over functional views? What URL scheme do you prefer for your file uploads and why?